Long known for its role in the intestinal absorption of dietary calcium, vitamin D has now been found to be important in protecting the body from a wide range of diseases. Disorders linked with vitamin D deficiency include stroke, cardiovascular disease, osteoporosis, osteomalacia, several forms of cancer, some autoimmune diseases such as multiple sclerosis, rheumatoid arthritis and type I diabetes, and even type 2 diabetes, depression and schizophrenia. A major culprit of vitamin D deficiency is inadequate sun exposure. Vitamin D deficiency is especially problematic for people who spend much of their time indoors, or who live in colder climates. The Elderly: The vitamin D precursor decreases in the skin with age, therefore elderly people are more prone to deficiency. Living in rest homes or becoming home-bound can limit exposure to sunshine. Muscle weakness and osteoporosis associated with vitamin D deficiency make the elderly more susceptible to falling and fracture risk. Clinical trials indicate that vitamin D supplementation may decrease the risk of fractures. Dark-Skinned People: Dark skinned people require much longer sunlight exposure to generate adequate circulating vitamin D compared to fair-skinned people. People with Limited Sunlight Exposure: People living at northern latitudes or who have limited sunlight exposure because of their working environment or cultural dress may have low vitamin D levels. Musculoskeletal Pain Sufferers: Patients with symptoms of hypothyroidism, non-specific musculoskeletal pain, chronic low back pain, or fibromyalgia are frequently found to have low vitamin D levels and show clinical improvement after supplementation. Vitamin D screening is strongly recommended in patients with musculoskeletal pain. Overweight or Obese People: Vitamin D can be locked up in fat stores in obese patients, who have been found to have lower levels of circulating 25-hydroxy vitamin D and are at risk of deficiency. Breast-Fed Infants, and Children with Limited Sunlight Exposure: All children require adequate circulating vitamin D to prevent rickets. Dark-skinned children and those who spend much of the day in indoor day care centers: Breast-fed children often receive inadequate amounts of vitamin D, particularly when their mothers are deficient. Maternal supplementation or the use of cod liver oil or other vitamin D supplements in infants and children can avoid the risk of developing type 1 diabetes in childhood. Deficiency may be present even when there are no symptoms, yet it is simple to correct and may solve a number of subclinical health problems and reduce risk for more serious diseases. Identify vitamin D deficiency as a potential cause of health problems – (levels below 32 ng/mL are thought to indicate deficiency – some experts suggest that levels should be >50 ng/mL for optimal health). Monitor a patient’s vitamin D status following vitamin D supplementation to ensure adequate dosing. Practitioners make appropriate recommendations for vitamin D supplementation, or appropriate lifestyle changes for patients who may benefit from increased sunlight exposure. Concern has been raised about the reliability of test results for 25-OH vitamin D from both serum and dried blood spots samples. Recently a plethora of scientific research has increased knowledge regarding key roles of vitamin D in health and disease, and sparked a tremendous increase in demand for laboratory analysis of vitamin D status. In effort to meet the increased demand several automated high throughput vitamin D assays have become available. Unfortunately several commonly used immunoassays, one of which has been utilised extensively in the past to establish reference ranges, have been found to be inaccurate and associated with high inter-laboratory variability. Many of the vitamin D immunoassays currently in use, are unable to distinguish between serum levels of 25-hydroxy (OH) vitamins D2 and D3, and having abandoned the traditional solvent extraction of samples, are prone to non-specific interferences. 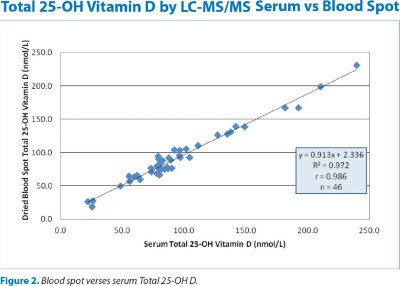 Doctor’s Data Inc. (DDI) has developed very precise and accurate liquid chromatography-tandem mass spectrometry (LC-MS/MS) methods for detecting 25-Hydroxy vitamin D2 and D3 levels from both serum and dried blood spot samples. The assay’s performance data displayed below provides assurance that clinicians can have full confidence in DDI’s vitamin D results for their patients using dried blood samples. 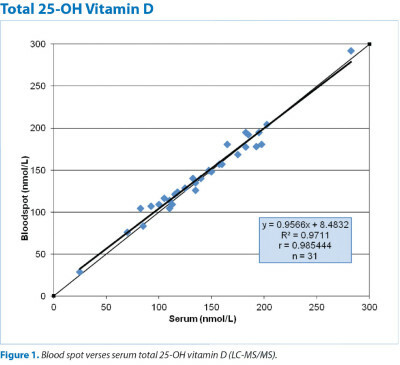 The US FDA stipulates that vitamin D assays must detect both 25-OH vitamin D2 and D3. The isotope dilution LC-MS/MS approach is currently considered to be the “gold standard” for measurement of vitamin D status. In an effort to circumvent the significant inter-laboratory variability in vitamin D results, the U.S. National Institute of Standards and Technology (NIST) has developed a candidate reference procedure that incorporates LC-MS/MS analysis and has made available a standardised reference material (SRM 968e, Fat Soluble Vitamins in human serum) for use in the standardisation of LC-MS/MS methods and results across laboratories. This is important because the results of one recent study (n = 50) suggest that results obtained using routine LC-MS/MS methods may be about 11% higher than those measured using the NIST candidate reference LC-MS/MS procedure (masking the true degree of deficiency in many cases). It is noted that currently no certified reference materials (CRM) are available for 25-OH vitamin D, so the NIST SRM 968e is the best alternative currently available. …DDI has excellent precision with respect to measurement of 25-OH D3 in serum and dried blood spots. DDI utilises a proprietary method for the extraction of the 25-OH Vitamin D2 and D3 from dried blood spots prior to analysis by LC-MS/MS. To correct for sample extraction and analytical variability, aliquots of deuterated 25-OH D2 and D3 internal standards are added to all samples, control specimens and calibration standards for every analytical run. The precision and accuracy of the DDI assay for serum 25-OH D3 has been determined by repeat analysis of three different NIST SRM samples over four consecutive days. The values for the three NIST SRM standards were established using the NIST candidate reference LC- MS/MS method. The data presented in Table 1 indicate that the DDI method for serum is very precise and accurate maintaining 97-100% concordance, even at a very low levels of 25-OH D3. The data also indicate that there does not appear to be any bias inherent in the DDI assay. Participation in external proficiency testing programs is a means by which laboratories can evaluate the accuracy of analytical methods on a given day, and see how they compare with other labs using similar or different methodologies. The College of American Pathologists (CAP) sends serum specimens to laboratories for analysis and the audited lab then reports its values to CAP prior to being notified of the expected results. Currently CAP is evaluating labs on a voluntary basis only for total serum 25-OH-Vitamin D and DDI is willingly participating in sample measurements to demonstrate the superior accuracy of their process. Once a lab has achieved a very accurate process, it is very important to clinicians that laboratories are able to reproduce these precise values from day-to-day and over extended periods of time. Table 2 confirms that DDI has excellent precision and inter-comparability with respect to the measurement of 25-0H D3 in both serum and dried blood spots (cumulative inter-assay CVs of under 3% and 4%, respectively). Such low inter-assay variability provides confidence that clinicians can rely on the DDI vitamin D blood spot test to accurately monitor the ongoing efficacy of any therapeutic intervention aiming to alter their patients’ 25-0H D3 levels. There is considerable demand for a precise and accurate method for assessing vitamin D status from dried blood samples (finger prick) collected by patients or clinicians. Dried blood spots have been validated to be an appropriate means of sampling for accurate analysis of several (e.g. insulin), but not all blood circulating metabolites. There are several inherent problems associated with collection of blood spots that can significantly affect test results. Therefore DDI have developed a robust blood spot test for vitamin D that provides results deemed equivalent to those from highly accurate serum measurements. To evidence this in a clinical setting, blood spots (finger pricks) were collected by 31 subjects as well as serum obtained by a phlebotomist. All samples were sent to DDI for analysis of Total 25-0H D. Figure 1 indicates that there was excellent agreement between the results from the blood spots and the serum samples, and there was no apparent systematic bias. These data provide evidence that highly accurate and substantially equivalent patient results for 25-0H D status can be obtained in the real life clinical setting from self-collected blood spots. To further evaluate the concordance of DDI results from blood spot measurements along with any potential margin of error from sample acquisition, two collection processes were performed for an additional 46 subjects. In this second study 26 subjects self collected blood spots and 20 subjects had the finger stick and blood spotting performed by a clinician; all samples were also accompanied by a serum sample prepared by a professional phlebotomist. The self collection arm of the study was performed under observance of a silent investigator in order to note potential common errors associated with self-collection of blood spots. 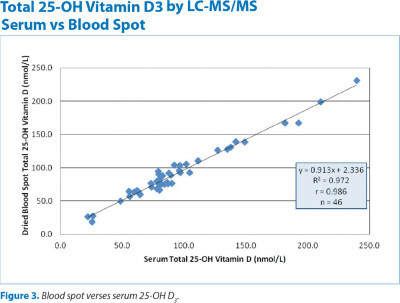 Doctor’s Data, Inc. (DDI) has developed very precise and accurate liquid chromatography-tandem mass spectrometry (LC-MS/MS) methods for 25-OH vitamin D2 and D3 levels from both serum and dried blood spot samples. Figures 2 and 3 depict the results confirming the results of the previous study indicating excellent agreement between a patient’s levels of Total 25-OH D and 25-OH D3 , as determined from DDI dried blood spots, whether self-collected or professional-collected, and serum. The self-sampling observations gathered from this study have been utilised by DDI in the preparation of their detailed collection instructions for achieving a proper sample. As a result of these explicit collection instructions, and the proven robustness of their blood spot method, DDI experienced a 99% acceptance rate of all blood spot card samples received. DDI finger prick bloodspot sampling for Vitamin D status is shown to be a robust and readily achievable sampling method, even for non-professionals, comparable in accuracy with the highest performing serum testing. Food Allergies: Are they Preventable? 1. Carter GD. 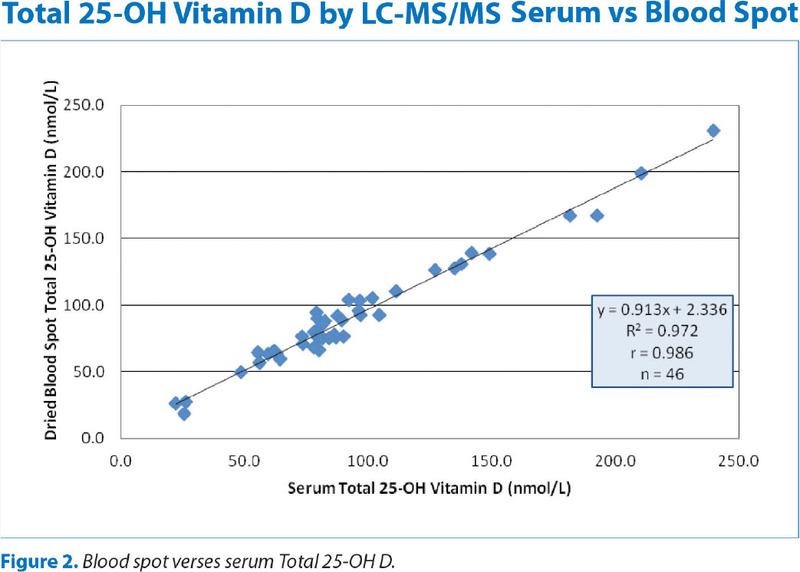 Accuracy of 25-hydroxyvitamin D assays: confronting the issues. Curr Drug Targets (2011)12:19-28. 2. Farrell C-JL,Martin S, McWhinney B et al. State-of-the-art vitamin D assays: A comparison of automated immunoassays with liquid chromatography-tandem mass spectrometry methods. Clin Chem (2012)58(3):1-12. [Accessed 1/19/2013]. 3. Larkin EK, Gebretsadik T, Koestner N et al. Agreement of blood spot card measurements of vitamin D levels with serum, whole blood specimen types and a dietary recall instrument. PLos One (20011)6(1):e166602 [Accessed 1/20/2013].